The Moto Van has been a staple of the moto industry since the 70’s and it hasn’t changed 40 odd years later. While the dedicated moto guy is still buying vans. The stereo typical moto van is being replaced rapidly by the new sprinter and other models similar. Would I like to do the same? Yes of course I would, but money doesn’t grow on trees and even though it’s not the latest and greatest it does the job and I really like the look of a traditional Van. I spend about 3 days a week at the track and to be efficient and organized for my line of work I would say it’s a must to have a van. I started with an empty Van and right away I knew I needed to put up some walls and insulate the van for a much quitter ride. I used ¼ inch plywood and some durable carpet from Lowes to to get a more cozy feel. I like to have a place for everything, so once the walls were up I built some storage boxes along the side the wheel wells to store spare parts, and clean or dirty gear. Building this helped me eliminate a gear bag which also helped open up space. I used the same ply wood and carpet to build these boxes so it matched the interior walls and ceiling. Most guys put up a partition wall to keep the fumes and noise out of the front of the van, but I chose not to. 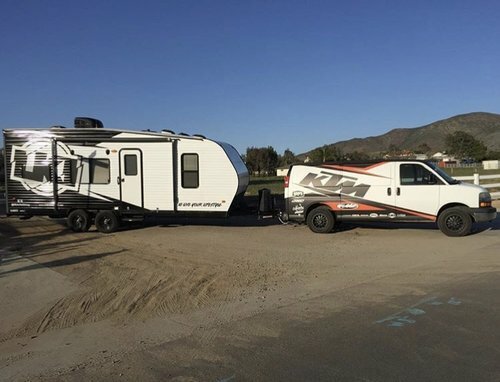 I normally don’t take my bike to the track because I’m always testing bikes for KTM so I like to keep the Van open for the occasion I surf or mtb and I can move around in the van instead of getting out and walking to the back. Like I stated before I like everything to have a place so I reached out to Pit Posse to get some key components that would help me be more organized. I wanted a seat to get dressed on and the Pit Posse seat is awesome because it folds up. Mounting it in the van was tricky so I added my own touch to the seat with some foldable card table legs cut to length for more stability when I was using the seat. When the seat isn’t in use it folds up and out of the way to clear motorcycle foot pegs. Keeping your tool box off the ground and secure is important also, so the Pit Posse tool box tray is a great product to accomplish just that. Just like the foldable seat I used the other two Card table legs cut to length on this for more support to secure the extra weight of the tool box. Like I stated before I don’t use a gear bag, so the Pit Posse helmet holder was an added bonus to keep my helmets off the ground and out of the way. The next thing I had to tackle was getting a bench seat for the back because I can’t leave my two kids hanging. Having the short van you don’t have much room for leg room and a bike so I split the difference where the seat was mounted so the bike still fit in the back. I got a bench seat from a junkyard along with the seat rails that needed to be cut to length. This turned out to be a lot harder then I thought when I realized that I had to cut through the floor and the heat shield at the bottom to bolt in the seat rails. I got my seat rails in and was happy with the space I had. The car seats for the kids fit great and a full sized adult could sit in the middle if I needed to carry a 3rd person. Once the seat was mounted I wanted to add a little base to the tunes so the crew at Kicker took care of me on the some door speakers, 10’ subs and a amp to power a clean little sound system. I used an older Alpine deck to control everything, because I’m normally just listening to Imusic connected with my phone. When it comes to performance for the Van it has the standard 4.8 liter V8, but I do wish I would have gotten the 6.0 because it would allow me to tow a little better. What I have done and I felt was a great investment was adding the Bully Dog GT platinum gas. I really like this addition for multiple reasons. This added 30 horsepower and better gas mileage on the high performance setting but you need to run 91 octane while on this setting. One great thing is the computer lets you know all of your data while driving. This model van doesn’t have that much data off the dash, but the Bully Dog system gives you everything you would need. Gas Mileage, Driving grade, RPM and custom ECU tuning. It goes with out saying that I like my stuff to look a certain way and the Moto Van is no different. Method Race Wheels supports a lot of the moto industry so I reached out Colbey Groom and his crew to get a set of 17’ Black Standard wheels. We all know a good rubber is important so I went to Best for Less tire in Temecula and put the all new Falcon wild peak 265/70/17. This tire is a great all terrain tire that wasn’t to aggressive for my long mileage runs for work. The Van is originally the color Red, but Alliance Visuals have done an amazing job wrapping the Van using a matte finish and adding the appropriate sponsor logos with in the wrap. The vinyl is a very expensive material so for the roof I chose to have Line-X San Diego spray my roof black. This is one thing that made a huge difference in appearance and quieting down the van.